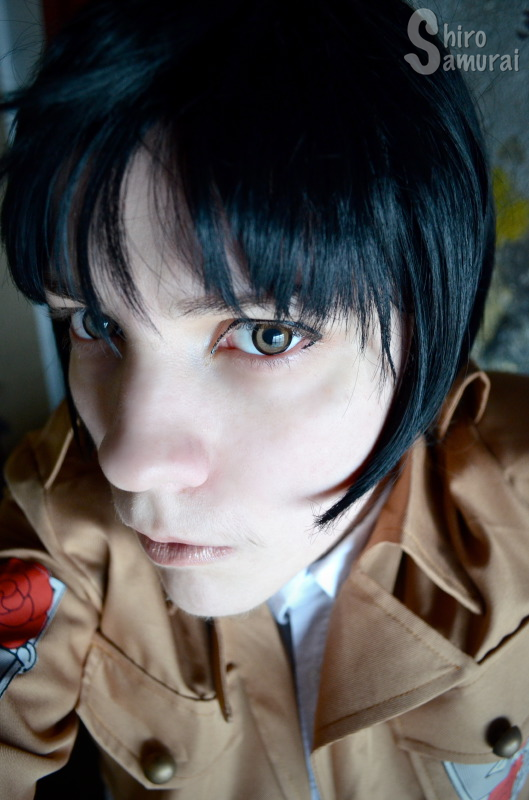 I'm gonna throw in a circle lens review here before Kitacon bombs in! 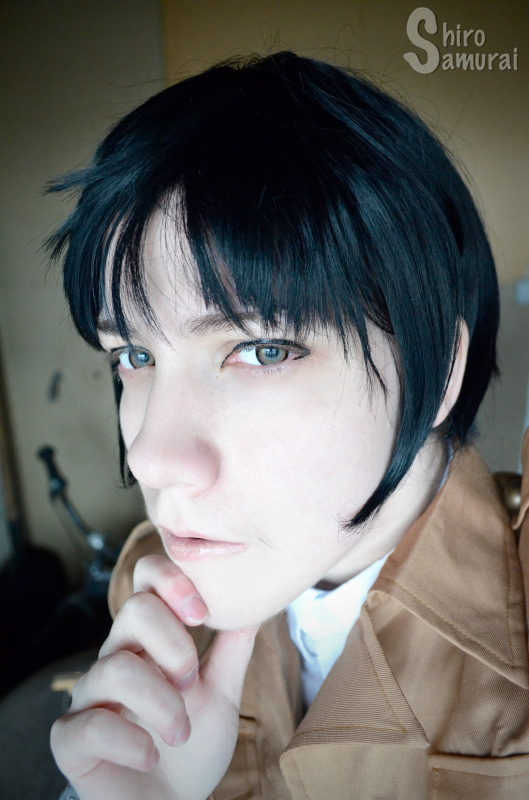 ^o^ Truth is that I had originally planned to use these lenses for when I cosplay Japan from Hetalia at said con but, err, I think I'll have to use another pair. ._. Read on and you'll know why! Notice the authenticity stickers! Beaucon has started doing that too! 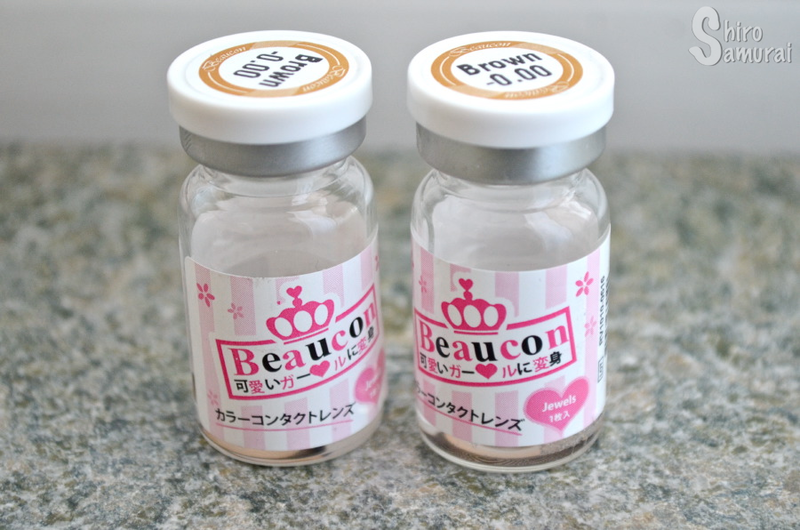 As far as I've seen Beaucon lenses can only be found at HoneyColor's site so yeah, that's where I bought mine, in case anyone is curious. 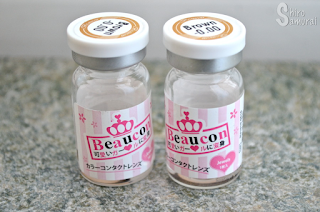 ^^ So yeah, these have a pretty much identical pattern to all those very popular EOS Sugar Candy and Vassen Sakura Candy lenses. Those lenses go under some different names but yeah, they're often called something with 'Candy' in the name and there's several different manufacturers making the same design – you probably know which ones I mean. So yeah, I took the lenses out of their bottles and put them to soak the night before. I had problems inserting them because they would constantly go out of my eye (with the eyelid movement when I blink) before setting properly. As soon as I got the first lens in (my right eye) it felt really uncomfortable and kept stinging. I took the lens out, cleaned it and put it back in again. I constantly still felt that there was something on my eye at all times (in an annoying way) and if I moved my gaze it would do this kind of scratchy feeling. My eye watered but I told myself to keep it on at least until I get all photos taken. 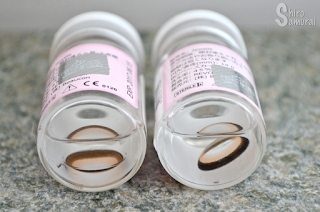 For some reason the left lens felt normal and I think I know why – the right lens was from a production batch that was to expire next month, if I didn't open them. Yes, that's December 2015!! D: So yeah, I'm pretty sure this is why the right lens kept feeling bad. Notice how they aren't enlarging my eyes much; I think this is a nice enlargement as it's still discreet enough to not look too dolly/unnatural but it makes your eyes stand out. These lenses have a very simple but appealing design – a single color and a thick dark limbal ring. I think that the limbal ring is not a true black but more or a really dark black-brown. It doesn't jump at you as much as some of the circle lenses with bolder limbal rings. All photos are taken by me during a November morning with a cloudy sky. There was a lot of fog (and frost on the ground) so yeah, the quality isn't as good as it could be, because of a lack of sunlight. Oh, and there's no color filters or such on the close-up photos and that's so that the colors would be as true to real life as possible. Indoors in my apartment, facing the window. Storage room indoors, natural light coming from the window. Outdoors facing the direction of the light. Outdoors, facing the corner of the building. I apologize for my eyeliner being derpy – my previous one that I had used for years finally called it quits and R.I.P:ed on me. While the new one has a more precise applicator than my previous eyeliner it also seems like it peels off easier. 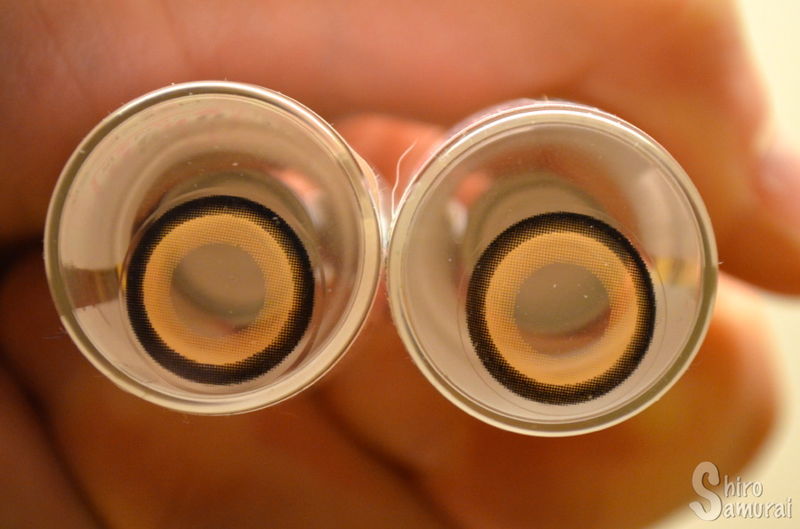 The color of the lenses is a light brown – it makes me think of toffee or something, yum! 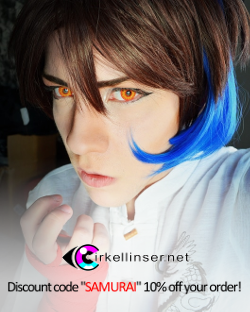 These lenses mix nicely with my real eye color which, by the way, is a light blue-gray with a greenish tint and a golden ring next to the pupil. I have chameleon eyes that adjust to their surroundings lol. 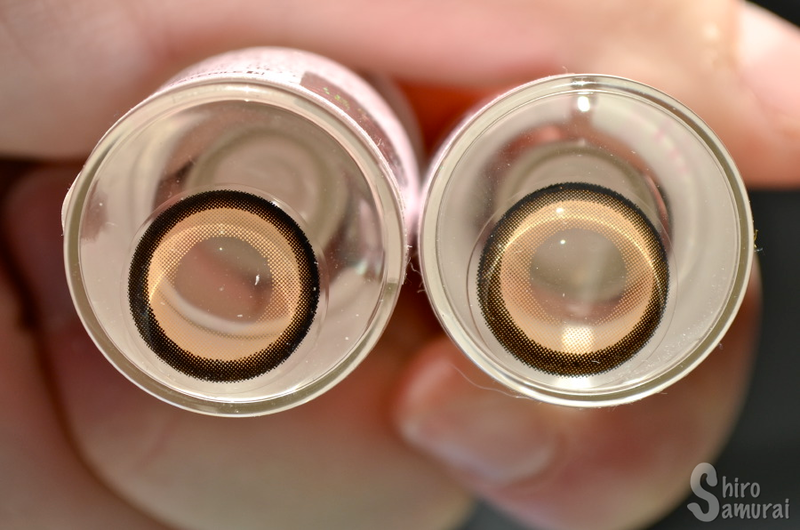 I would really like these lenses a lot, if it wasn't for the highly disappointing comfort. :'( It's such a letdown. For some reason it seems like everyone, except me, finds these lenses to be comfortable? 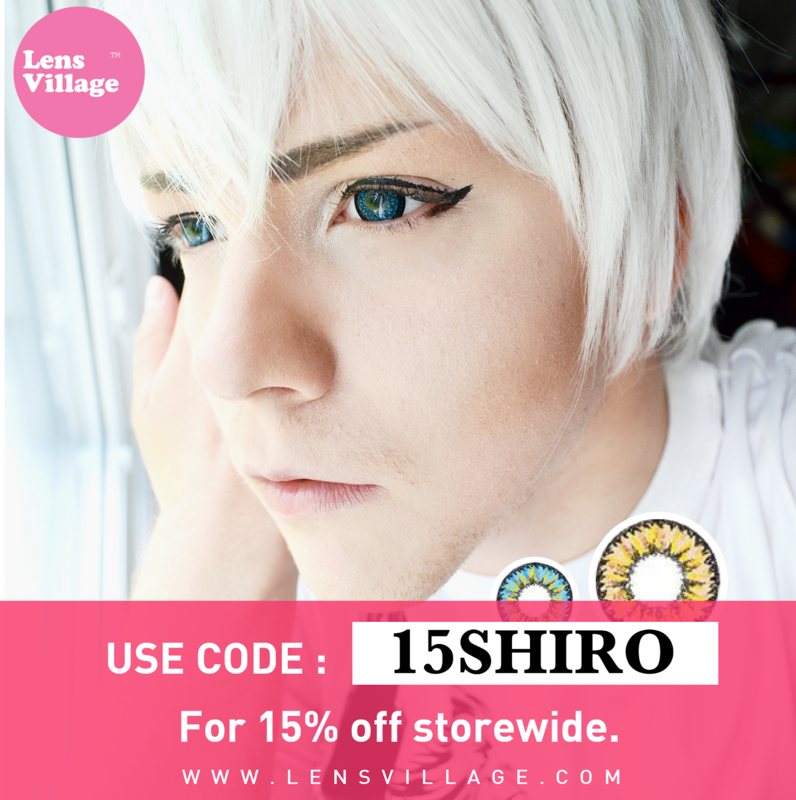 So yeah, even if a part of me wants to grade a higher number for comfort (because I still want to love these lenses) I just can't justify it because I couldn't wear even the better lens for 2 hours. :/ I hope that my other Beaucon pairs will be more comfy than these – maybe this was just an unlucky pair combined with one lens expiring way too soon? Nice and pleasant light brown. The color is reminiscent of toffee. Simple design but it's very likable. It works great for cosplaying male anime and video game characters. 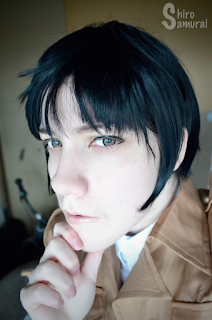 Opacity is good because the lenses change my eye color notably. It's small but it's there. The right lens is almost unwearable (possibly because it would have expired next month had I not opened it) although the left one is comfy but dries reaaaaally fast. I can't wear these for more than 2 hours. 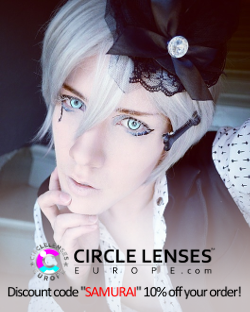 The thick dark limbal ring easily gives them away as circle lenses, even though the size and color are okay. 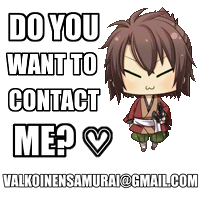 Shiro Samurai says goodbye! Thanks for reading! All of them I've bought from on multiple occasions and I always received my orders in a timely manner, had good customer service and of course received authentic (and thus safe to wear) lenses. ^^ You can buy from any of those listed with confidence.